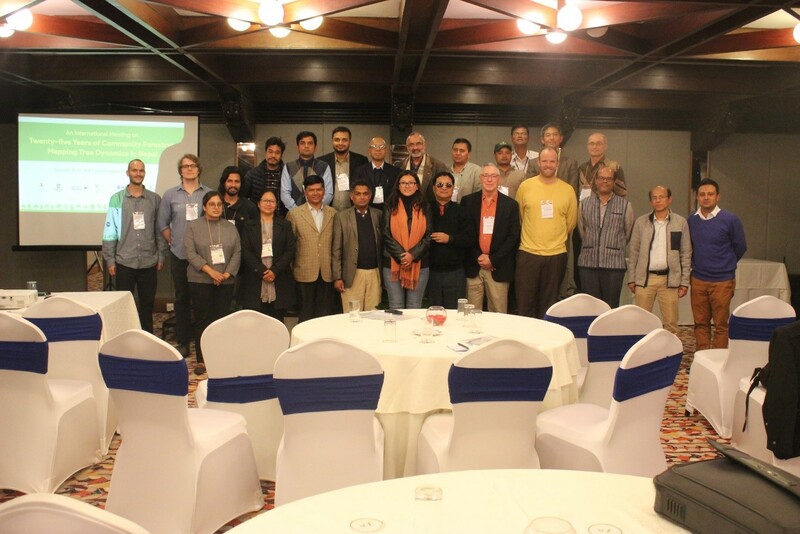 An international meeting on Twenty-five years of community forestry: Mapping tree dynamics in the Middle Hills of Nepal. Since the 1980s, Nepal has gained worldwide recognition for path breaking achievements in community forest management. Forests account for upwards of 45% of Nepal’s national land area (nearly 6.5 million ha) and are one of the country’s major productive resources, contributing about 10% to the gross domestic product. In 1988, Nepal’s Department of Forests (DoF) identified 61% of the nation’s total forest area (3.5 million ha) as forest that could be transferred legally to local communities and managed for their benefit. Today, community forests occupy nearly 23% of Nepal’s total forest area (1.8 million ha), the management of which involves over 22,000 community forest user groups comprising 1.8 million households and nearly 40% of Nepal’s population. The spatially-explicit impacts of this transition in forest management have not been documented in part due to the difficulty of mapping tree cover in mountainous environments where remote sensing imagery analysis is hindered by topographic effects, e.g., shading, the presence of clouds, snow, and ice, and the inaccessibility of areas of rugged terrain for ground truth data collection. Indeed, only a few national scale forest surveys have been conducted. Mapping Nepal’s forest transition and developing a comprehensive understanding of factors underlying observed changes in tree cover are critical if Nepal is to improve upon its already successful resource initiative. We distinguish between tree cover and forests because in the Middle Hills a number of unirrigated agricultural lands have been abandoned and replaced with tree cover. Our remote sensing work does not distinguish between closed canopy forests and tree canopy so where possible we prefer to use the term ‘tree cover’. We will introduce the cloud-based Google Earth Engine (GEE) platform for Big Data remote sensing analysis, and provide hands-on training with a range of processing techniques and open-access datasets available through GEE. With an understanding of GEE in place, we will discuss in detail the new 25-year Nepal tree cover/change dataset including its methodology, accuracy, and derived products. For comparison, we will also discuss access and use of the Hansen et al. global forest cover dataset.